Golarion is an old world, and even its oldest civilizations stand atop the ruins of more ancient nations, long lost to the ravages of time. Each of the six cities presented in this book offers enough new challenges and treasure to support an entire campaign of any level. Take your game into the great unknown and make history at your table. Ilvarandin, a teeming metropolis hidden deep in the treacherous Darklands, ruled by sinister creatures who supply the surface with a strange drug, though which they plan to enslave the entire world's dreams. Kho, the crashed flying city of the ancient Shory, whose still-sputtering magical engines lure explorers to the verdant Mwangi Expanse - and into the clutches of its resident marids, plague-bearing daemons, and winged ape-men. Storasta, the once-verdant jewel of Sarkorian civilization now enveloped by the Worldwound, where the corrupted forces of nature battle the hordes of the Abyss for control. The Sun Temple Colony, where humanity struggles against a twisted godling and a fire-spewing orbital lens in an attempt to establish civilization on the ruined continent or Aslant. Tumen, the ancient Osirian cliff-city, where cultists, golems, and desert elementals guard the greatest works of long-forgotten pharaohs. Xin-Shalast, City of Greed, in which gold-paved streets and crumbling mountainside monoliths lead to ultimate wealth and the strange otherworld of the Plateau of Leng. 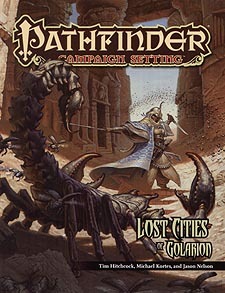 Lost Cities of Golarion is intended for use with the Pathfinder Roleplaying Game and Pathfinder campaign setting, but can easily be used in any fantasy game setting.